"friday-lunch-club": Even al Jazeera: "Massive turnout of expat Syrian voters saw a majority voicing support for Assad"
Even al Jazeera: "Massive turnout of expat Syrian voters saw a majority voicing support for Assad"
"... Beirut, Lebanon - This was not an ordinary voting day. It was a parade of Syrians celebrating their embattled president and expressing support for him in the battle to quell the uprising that erupted against his rule three years ago.Since early morning, tens of thousands of Syrians flocked to the heavily fortified area surrounding the Syrian embassy in Lebanon as expatriate voting began ahead of the June 3 presidential election. 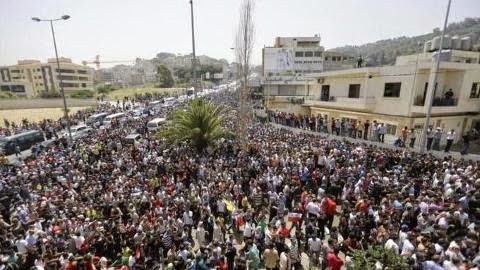 With some of Lebanon's one million Syrian residents and refugees trying to cast their votes, this was the most visible mass gathering the country has witnessed in the past few years and possibly, the largest-ever gathering of Syrians outside their country...."